Metal Zone - Voicing: pre, post, and inter-stage EQ is set up for a dry, scooped-mids sound, with a lot of clipping. I found that no matter how much pre and post EQ I did around the Metal Zone pedal, I could not get a convincing liquidy neck-pickup tone like I could by using the same technique with the Chandler Tube Driver, a standard distortion box. 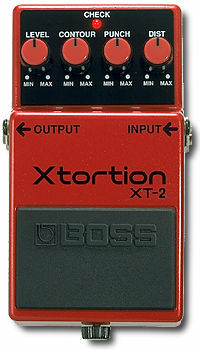 "Xtortion - Totally original distortion sounds. "Contour" and "Punch" controls for radical sound altering. Contour cuts highs or boosts highs and lows. Punch controls the distortion depth and adds a mid boost. Creates a wide range of distortion tones that are unavailable from other pedals - extremely versatile. The XT-2 provides a cutting-edge, '90s distortion sound that can sing as well as grind. The PUNCH control adds a midrange edge, while the unique CORNER control cuts highs or boosts highs and lows. The XT-2 is a versatile pedal that lets you get any sound from thrash metal to grunge to hard rock." 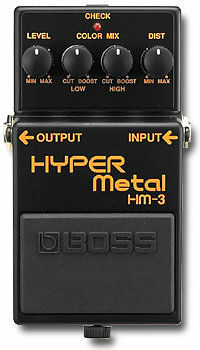 "HYPER Metal - The HM-3's internal circuitry is designed for greater gain and accurate dynamic response to produce a powerful, hard-edged sound with awesome sustain - just like you'd expect from fully overdriven stacked tube amps. Usingindependent COLOR MIX controls for high and low frequencies, you can create just about any tone from mild and crunchy to heavy and metallic." Not good for a classic saturation tone such as Zeppelin or most of Slash. This is more of a Slayer, death metal, or black metal tone. This might even be an excessively crusty preamp clipping for Metallica. It sounds to me like they relied on 6550 power tube saturation *more* than any sort of preamp clipping. Well, see my page "Metal Tone".